I figured my next #linocut project. I’m using a Dance of Death theme but I’m including my favorite Xmas baddie: Krampus. Krampus is a horned, anthropomorphic figure described as “half-goat, half-demon”, who, during the Christmas season, punishes children who have misbehaved, in contrast with Saint Nicholas, who rewards the well-behaved with gifts. Regions in Austria feature similar figures and, more widely, Krampus is one of a number of Companions of Saint Nicholas in regions of Europe. The origin of the figure is unclear; some folklorists and anthropologists have postulated a pre-Christian origin for the figure. Dance of Death – Krampus. My first test print on my new printing press. I need to carve away some of the background – it’s too busy and do some minor touch up in regards to Krampus’ fur and some of the skeleton lines. But pretty happy with it. All carved except some minor touchup based on printing. 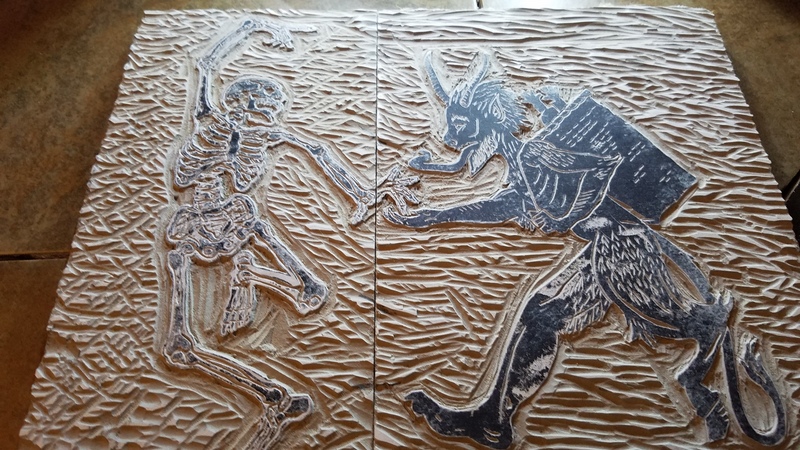 First test print of Dance of Death – Krampus. 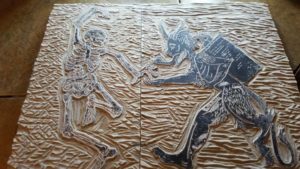 This entry was posted on May 30, 2017, 2:47 pm and is filed under Art - Relief Printing. You can follow any responses to this entry through RSS 2.0. Both comments and pings are currently closed.